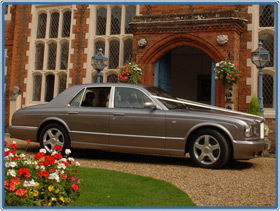 Arnage Executive Hire was formed in 2006. Primarily our cars were the iconic Bentley Arnages hence the company name. The Arnage was named after the famous bend on the Le Mans motor racing circuit in France but as time went by the "3 box " shape of the Arnage began to look dated and Bentley replaced them with the sleek and aerodynamic Continental Flying Spur. We have regularly upgraded our Flying Spurs and now have 3, 2 white and one silver. They are very much in demand and have graced over 2000 weddings since we bought them and are popular with brides from all walks of life and cultures. A few years ago we began to get requests for vintage cars and invested in our first Beauford, a 2 door two tone blue and silver model. Since then we have added a further 5 Beauford 4 doors in either white or cream. Beaufords are totally beautiful to look at and never fail to draw attention from wedding guests eager to have their picture taken with it or sit inside. When we have one parked outside our premises I am regularly asked by passers by if its ok to take a photograph of it. With vintage cars seeming to be the fashion at the moment we have added 2 vintage Regent Landaulettes and a replica vintage Asquith London Taxi.